On Saturday night, in response to ‘hackers’ who were talking about the security threat that Aadhaar poses, TRAI chief RS Sharma published his Aadhaar number online and challenged the hackers to prove what harm they could do. What followed was netizens going back and forth, and the hackers, seemingly publishing publicly available data as data hacked using Sharma’s Aadhaar number. The Wire too decided to jump in the fray by publishing an article which spoke about a host of issues that deserve to be spoken about in the light of the recent string of events with respect to the TRAI chief giving out his Aadhaar number publicly. In the article headlined “By Revealing His Aadhaar Number, the TRAI Chairman Has Opened a Can of Worms”, listed how a host of information like mobile number and RS Sharma’s Whatsapp image was “leaked” by the “hackers”. It then added an update to the string of “personal information” that was outed. The update read – “Apparently someone has ordered a OnePlus 6 for the chairman, via Amazon, cash on delivery”. This assertion was also reiterated by The Wire when they tweeted Pahwa’s article. 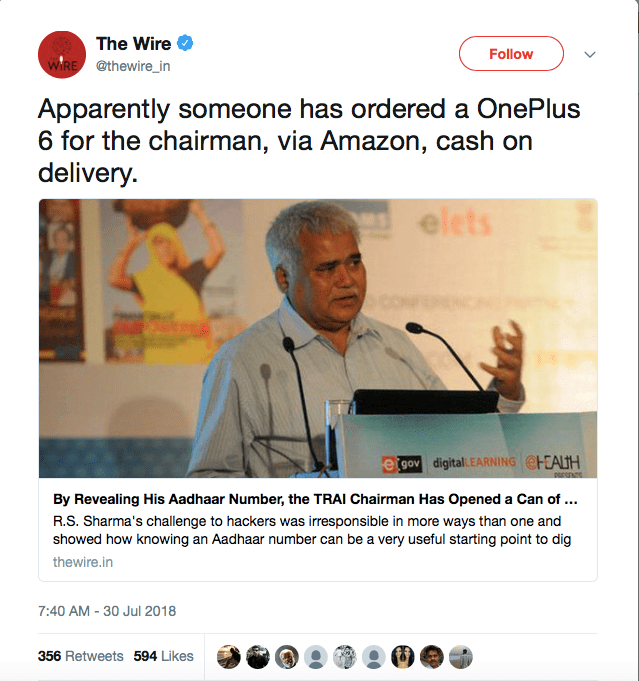 The Wire article, to evidence how unsafe Aadhaar is asserted that someone had ordered a OnePlus 6 for RS Sharma from Amazon on a cash on delivery (CoD) basis. However, when one checks Amazon, one realises that firstly, CoD is not available for payments above Rs 30,000 and specifically, CoD is not available for OnePlus 6 either. 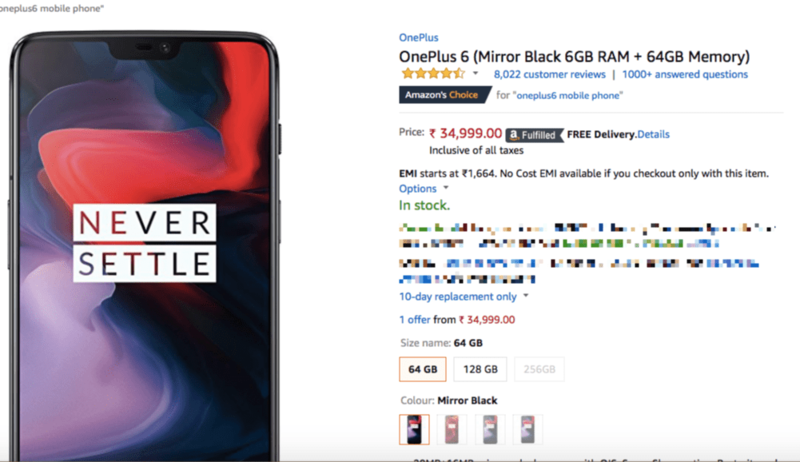 One of the lowest priced OnePlus 6 on Amazon is priced at Rs 34,999. When one goes to Cash on Delivery option, it says the CoD option is not available for this product. 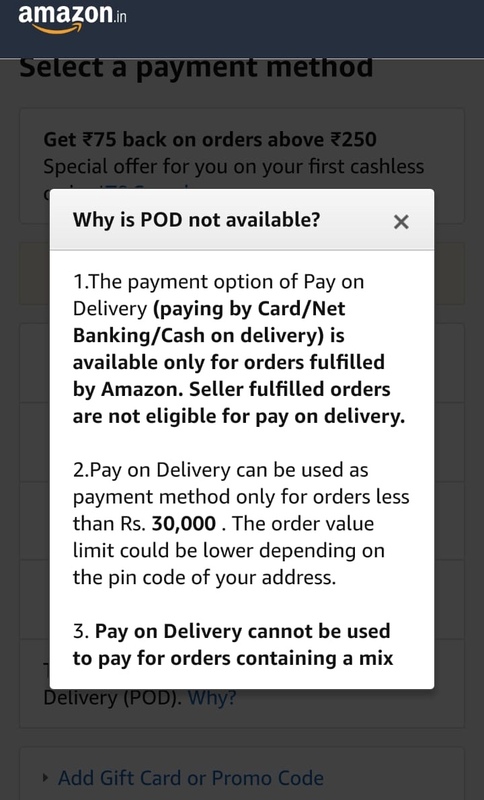 The reason provided is that the ‘Pay on Delivery’ option can only be used for orders less than Rs. 30,000. It is evident that nobody could have possibly ordered a OnePlus 6 mobile phone for RS Sharma from Amazon on a Cash on Delivery basis as asserted by The Wire. It is no surprise, however, that such a shoddy assertion would be pass editorial muster at The Wire. The publication is known to peddle half-truths and whole lies as a force of habit with a long list to their credit. The Wire, which is being sued for defamation often publish articles that read like Hurriyat press statements. Their article has in the past incited violence. They were recently slammed by the CBEC for peddling fake news. They were blamed by a stand-up comedian for spreading lies in his name. Have peddled ‘data’ from dubious organisations. Was slammed by cricketer Mohammad Kaif was bringing caste into cricket. Has a video series that regularly obfuscates. Its journalists are abusive trolls and people who share communally sensitive fake news. They have in the past tried to rationalise the 1993 bomb blast. Conducted a hit job against Sri Sri Ravi Shankar. Defended Chidambaram’s 20:80 gold scheme that benefitted private players like scamster Mehul Choksi. The Wire is a portal where the Editors tell their journalists to not out “Dalit activists” who heckled her. Where their contributors are accused of sexual harassment and their journalist’s conduct drove a female journalist to commit suicide. They had shamelessly compared the Indian Army General to General Dyer.